Visit our Black Bear Meet Hub for Videos, Photos, Interviews, and Posts from this and past years!! LIVE TWITTER INSTAGRAM UPDATES! RACE VIDEOS + POST RACE VIDEO INTERVIEWS! The Black Bear Invite looks to be a great mid-season test for some of the top teams in the state, including 5 currently ranked teams: #1 Bishop Guertin, #4 Coe-Brown, #5 Con-Val, #7 Oyster River, and #8 Hanover. After their state topping performance at MI43, if at full strength, Bishop Guertin (NH#1) must be favored. They have the advantage of having 2 low sticks in Caroline Fischer and Caroline Towle along with the ever vital supporting cast. Having raced the challenging CBNA course a year ago, look for the Lady Cardinals to continue to gather momentum at Black Bear. If BG is not at full strength, look for host Coe-Brown(NH#4). The Lady Bears should have home course advantage this coming Saturday. Led by freshman Addison Cox and senior Eleanor McDonough, if they can shrink their pack time, they could surprise. The surprise of the season thus far has to be NH#5 Con-Val. Boasting two front runners of their own in Rachel Hurley and Clare Veverka, Con-Val has been climbing the rankings each week thus far. The last couple weeks has seen another potential rising power in NH#7 Oyster River weather some injuries. 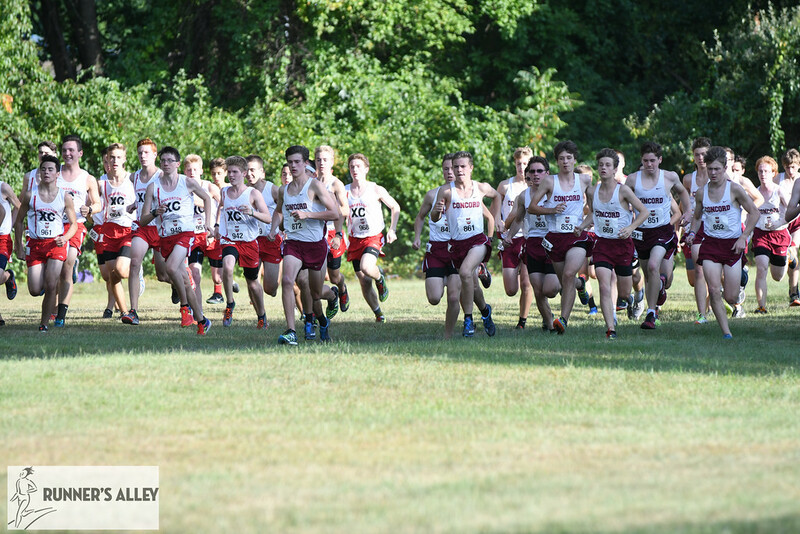 If they can get every one healthy coupled with Danielle Slavin’s continued pure love of cross country, the Bobcats will make some noise and climb the rankings themselves. The ever steady Hanover, NH’s #8 team, is very consistent and are led by Leila Trummel. If any of the aforementioned teams falter, look for them to capitalize. As with last year, we cannot over look Phillips Exeter Academy, the defending champion. They do return, but without many results this season, they are difficult to forecast. However, easy to say they will not be sneaking up on anyone in 2017. Individually, all eyes will certainly be on Milford’s Rebecca Durham, who actually kept Jackie Gaughan in her sights at MI43 in the breakthrough race of her prep career. Caroline Fischer’s 2016 course record, 18:12 is very much in jeopardy. Fischer should be leading the chase pack which should also include OR’s Slavin, BG’s Towle and Haley Schmitt, Con-Val’s Hurley and Veverka, CBNA’s Cox and McDonough, Mascenic’s Sam Bilodeau and Milford’s Lauren Robinson. Obviously PEA will have an individual or two in the mix. Over the past several years, the Black Bear Invitational has been a showdown of sorts between Coe-Brown (NH #5) and Oyster River (NH #3). With their superior depth and strong start, Oyster River is the favorite. Yes, the Bobcats most certainly benefit from senior transfer Kieran Murphy, but they would have been favorites anyway given their depth and strong performances last weekend by Henry Keegan, freshman Andy O’Brien, and Max Stenslie. After replacing 5 of their top 6, Coe-Brown had a strong MI43. While they don’t quite look ready to challenge the top few teams in the state, if OR has an off day, don’t count out the hosts. Led by Evan Tanguay, who had the fastest NH time this past weekend, the Bears sport a couple strong freshman of their own in Luke Tkaczyk and Wyatt Mackey. Along with upstarts Dawson Dubois, Sam Patteson, and Gavin Lewis, the Bears have potential. The most intriguing team on Saturday could be NH #8 Mascenic. Laying low over the beginning of the 2017 season, Mascenic looks to make an impact on Saturday especially after D3 rival Kearsarge sported an insane pack time at MI43. With a cast of new characters including sophomore Dakota Somero, do not count out Mascenic to be on the podium especially considering their coach is one Mike Smith. Along with the Vikings, look for NH #10 Winnacunnet to make their presence felt as well as last year’s runner-up Phillips Exeter Academy. Individually, Tanguay looks to have the hot hand right now, but don’t count out MV’s David Reynolds, OR’s Murphy, or Campbell’s Jeffrey Allen. Reynolds and Murphy have been going back and forth this season with Reynolds winning the Bobcat Invitational two weeks ago, but Murphy besting him this past Saturday. The chase pack should be comprised of Keegan, Wyatt Pooler (Kingswood), Somero, Windham’s Spenser Sawyer, and OR’s Stenslie. After incurring an injury earlier this year, Pelham’s Cameron Starr is entered. If he comes and races healthy, given his prior accomplishments, he would have to be considered among the favorites. As with the girls, count on a few PEA kids sprinkled in, especially considering their alum, Atticus Stonestrom won the individual title last year. Next post WMUR’s Hometown Hero! Milford’s Rebecca Durham!